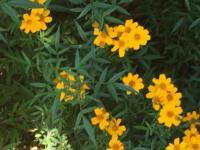 The cosmos are growing leggy and ragged, and many of the summer annuals and spring-blooming perennials are fading fast. Autumn is hot on the heels of summer, yet here in Marin we can expect to enjoy several more weeks of backyard relaxation before the chilly fall weather chases us indoors. As we make the most of our Northern California weather, it is only natural for us to want get the most out of our gardens. Our outdoor living spaces should beckon visitors with open arms and cheery color. If your borders and beds aren’t giving you that come hither look, there are lots of no fuss perennials, annuals, and shrubs to choose from for a late summer, leap-into-fall color boost. Plant one or more of these now for long-lasting blooms that stand up to the heat.